It’s hard for kids to get the movement their bodies so naturally crave. 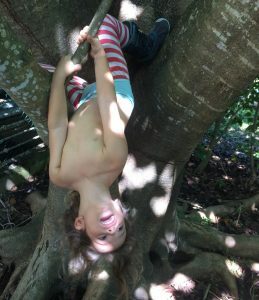 Distractions like schoolwork and technology get in the way of playing outdoors, climbing trees, swimming, and running wild. Many schools don’t offer recess, or free time for kids, or physical education at all. If kids aren’t getting opportunities to practice their gross motor development, and schools aren’t helping to progress them, what will happen to our kids’ fitness levels? Babies are born with some pretty awesome abilities. These innate abilities can be nurtured or squelched. Giving your kids freedom and ways to be physically active is nurturing their physical health. Not giving them opportunities, or encouraging more non-active time can squelch their innate physical abilities. Some of the abilities infants are born with are designed not to last, but so many can’t last if we do not use them. It’s important to be aware of some of these innate abilities so we can really foster them in our children. Once babies can hold their heads up you may notice how straight their backs are. Instead of slumping over when carrying them, or after learning to sit, they tend to keep their heads high. Try sitting on the floor a while with a perfectly straight back and it’s probably not comfortable for you. Notice how kids, as they get older often start developing bad posture. Their torso muscles have declined from lack of use. Have ample floor space for floor sitting in your home, this will help keep them sitting and standing strong! Be a role model too. If you have good allignment and gait, your child will pick up on it! 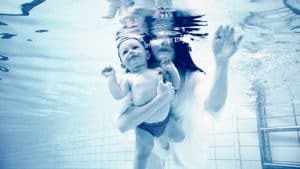 Did you know infants are born with the talent to hold their breaths when submerged in water? They will also begin to wave arms and legs and swim! This natural response declines around 6 months if they don’t use it. However, using it as a basis for swimming and continuing to give your baby opportunities to swim (with you or a trusted adult, of course…never leave a child unattended in the water! ), they grow in their natural swimming abilities. Newborns’ grip reflex is one of the most popular. People just love to put their fingers in a babies hand to get grabbed! The newborn grasp reflex generally disappears around 4 or 5 months. For a month or so afterward they have a more difficult time with grabbing and often don’t show a big interest in it until they start understanding how to reach and grasp. Their interest in grasping is why we are able to introduce basic hanging to them. Doing this often, with some sort of bar or stick or pole they can grab, helps them to love hanging as children. Hanging is superior to most activities for upper body strength in kids so we definitely want to encourage it! Ever notice how much kids love to run? Foster that love with games of tag, chasing, paths, or big open spaces! They stop loving it when it becomes work. It becomes work if they’re forced to do it in an a way that’s not appealing to them or if it’s too hard for their body. It becomes too hard for their body when they don’t keep up with it. I’ve noticed kids can walk much longer if it’s a fun walk, stopping to explore, talk about something, or even short bursts of chase throughout! From a young age, most kids love to climb. 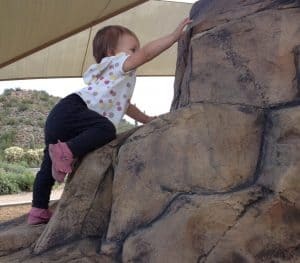 Whether it’s on Mom or Dad, or climbing up furniture, they have a natural love for it…mostly due to their natural curiosity (imagine life as small as your kid and you can see why they want to get higher!). Let them climb by putting up safe places. Move the cushions off your couch to let them climb up and onto it, pile up folded blankets and pillows on the floor or bed to make a mountain, find big rocks and good trees to climb, or go to playgrounds to find stairs, ropes, and bars to climb on if you have no natural structures. It’s important to let go a little bit, however scary, when your child is climbing. Constantly holding on to them or telling them “be careful!” or “don’t go high!” is actually telling them “I don’t think you can do it” and “you’re going to get hurt”. Kids have an innate sense of what is safe when it comes to their abilities! Sometimes it’s not possible to get out of the house, and it’s not ideal to constantly be playing exercise games. If you’ve been encouraging their innate abilities above, natural movement is already incorporated into their lives (good job!). 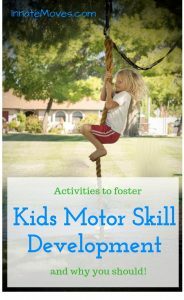 Don’t leave the rest up to their gym teacher, or coach, but continue to foster natural gross motor development in the home as well! Make your home movement-friendly by creating space to move freely in. Getting rid of some furniture will allow for more room to sit and play on the floor. Being on the floor encourages a body to move much more naturally than on a couch. Set up items to hang on. Invest in gymnastics mats or let them bounce and play on the beds for soft surfaces to practice risk-taking. Do some of your “learning” activities outside. Try a super fun outdoor activity for coding! I live on the beach and my kids and I practice math problems and writing letters in the sand. Turn their play area into a sensory gym! Walk more places if possible, or go for daily walks. Walking is the most innate activities for humans so, while biking, skateboarding, etc, are great exercise, walking should be prioritized. Play outside as much as possible. Spending time outdoors tends to naturally get kids moving. The open spaces, trees to hang from, rocks to jump over, and puddles to splash through are all too tempting for most kids not to move. Foster their natural love for moving in nature by spending a lot of outdoor time together, near climbable trees, around water, and climbing hills. 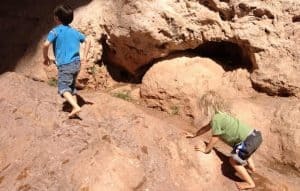 If you have trouble coming up with outdoor activities, check out these fun outdoor activities for kids! Create obstacle courses for them! Obstacle courses are great for getting kids into different body positions and moving in very dynamic ways – don’t be afraid to make it challenging! Get some awesome ideas for obstacle courses here! Lead exercise games, or fitness games with them. I find my kids will play longer when I play with them. Games like “What Time is it Mr/Mrs Fox?” or “Red Light, Green Light” are great, or “Simon Says” for smaller spaces. One of our favorites we call “Super Fast Action”. You shout out pre-determined body positions and they do them as you go faster! Here’s a list of 15 outdoor group games to play, complete with instructions. Play animals! Moving like different animals gets their bodies into a lot of primal positions. Animals to try include – frogs, bunnies, crabs, cheetahs, sloths, snakes, caterpillars, birds, etc. Animal charades is one of our favorite family games. For young kids and toddler activities, check out my post on toddler gymnastics skills to try at home. For more info on starting your child with gymnastics, check out my kids gymnastics at home. (Coming Soon!) Innate Moves Kids Fitness Series is all about fun exercises to do at home! These kids workout videos were designed to be engaging to offer fun workouts for kids. Incorporated in the videos are the foundations of an overall physical education program. Children will learn how to move their body in natural and safe, but challenging ways. Each video of the series builds upon the last so children are growing in skills, while learning new ones. The series is perfect for a homeschool P.E. program or for kids that are not offered P.E. in their schools. My kids’ love Cosmic Kids Yoga. The videos are entertaining and get them moving in small spaces!